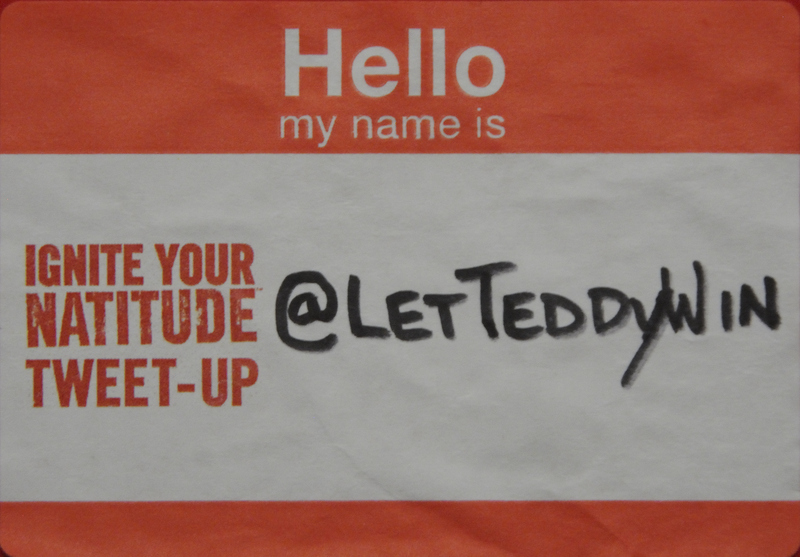 Twitter | Let Teddy Win! For six years from 2006 through 2012, Washington Nationals fans talked of The Curse of Teddy Roosevelt, and everybody knew what they meant: Teddy’s continued losses in the team’s presidents race were seen as a curse that kept the team from winning. But since the Rough Rider won his first-ever presidents race title this year, and extended his victorious ways into the 2014 postseason, many fans have concluded that the Nats are doomed to playoff failure precisely because Teddy is now winning. An informal review of this week’s playoff chatter on Twitter (excerpts below) reveals a strong anti-Teddy Roosevelt sentiment that grew with each Bull Moose victory and each Nationals postseason loss. Talk of a curse among fans goes back to the days of RFK Stadium, and was the inspiration for this blog, but of course back then it was Teddy’s failure to win that was the problem. After the team opened Nationals Park and Teddy’s losing streak passed the 250 mark, Washington Times columnist Thom Loverro first compared it to famous baseball curses that had prevented the Cubs and Red Sox from winning for generations. When the Nationals signed free agent Jayson Werth in 2011, the team’s new outfielder spoke openly of the curse, going so far as to say that the Nats wouldn’t win if Teddy didn’t as well. Before his first season had ended, Werth had personally tried to interfere and stop Teddy’s losing streak. Even the next season when the team built the best record in baseball, Werth continued to insist that Teddy’s losing streak was a curse. As the Nats improved on the field and Teddy’s streak passed 500 losses, a Ken Burns mini-documentary plus cover stories in The Wall Street Journal and other media outlets turned the curse into a national story. Even The White House called for a victory by Teddy to break the curse. Then remarkably, just before the team’s first playoff appearance in 2012, Huffington Post editor Brandon Wetherbee, a longtime Cubs fan, pleaded that the Nats not let Teddy Win until after the team won the World Series. He argued that a Teddy victory followed by anything short of a championship would forever link Roosevelt to a reversed curse, much like the Curse of the Billy Goat that has haunted Cubs fans since 1945. The Nats clinched the 2012 division title, then the team let Teddy win on the last day of the 2012 season and again in the playoffs, and Teddy has won each of the team’s postseason races since. 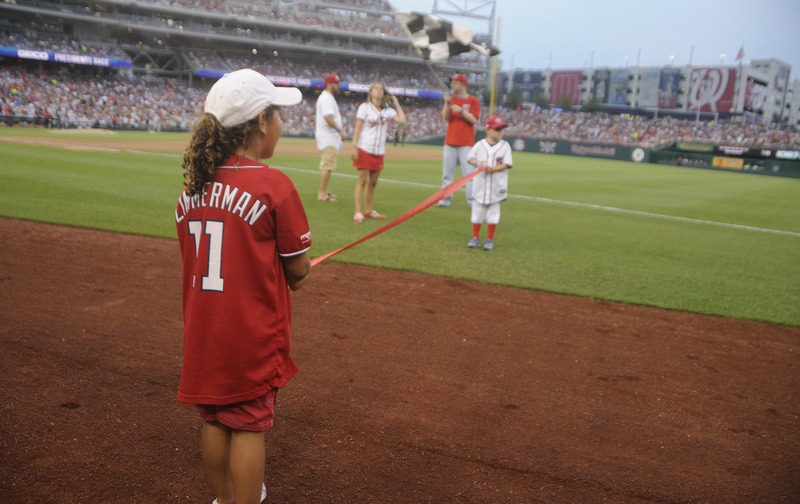 #Nationals haven't been the same since they started to let Teddy win races.. So what’s the actual record say? This record includes two occasions in which the Nats played a 13-inning home game. Both times, Teddy won the late “bonus” race, and the team lost. Counting only the regular fourth-inning race, the team was 18-6 (75%) when Teddy won. But the story changes during the postseason. Since Teddy’s first win in 2012, the Nats have played five home playoff games. Teddy has won all of the presidents races, including two during Saturday’s 18-inning contest, and the team has posted a dismal 1-4 record. Teddy wins 1st 2014 postseason presidents race. Have they learned nothing? @MJAttic This is what happens when they let Teddy win! 13 innings? Clearly because the @Nationals let Teddy win. We can't let that happen again. The curse! It's the curse! 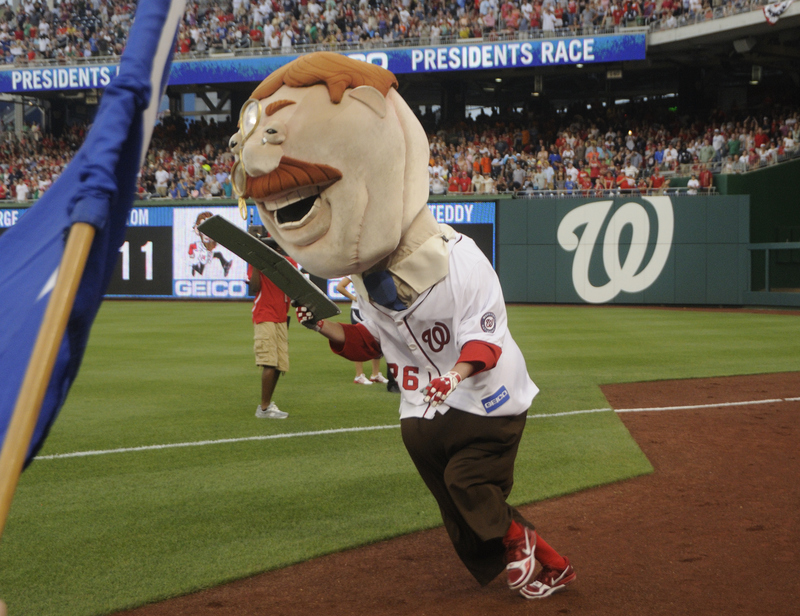 Why did the Nats ever let Teddy win the President's Race? What has to happen for the #Nats to realize the #TeddyCurse is real? @dcsportsbog Didn't they let Teddy win in the last game of the regular season? When are the nats gonna learn. When the Nats hit the road and won game three in San Francisco, things quieted down. The momentum had shifted, but people still were getting digs in at Teddy. Then came game 4, in which defensive gaffes and wild pitches led to all three of the Giants’ decisive runs. 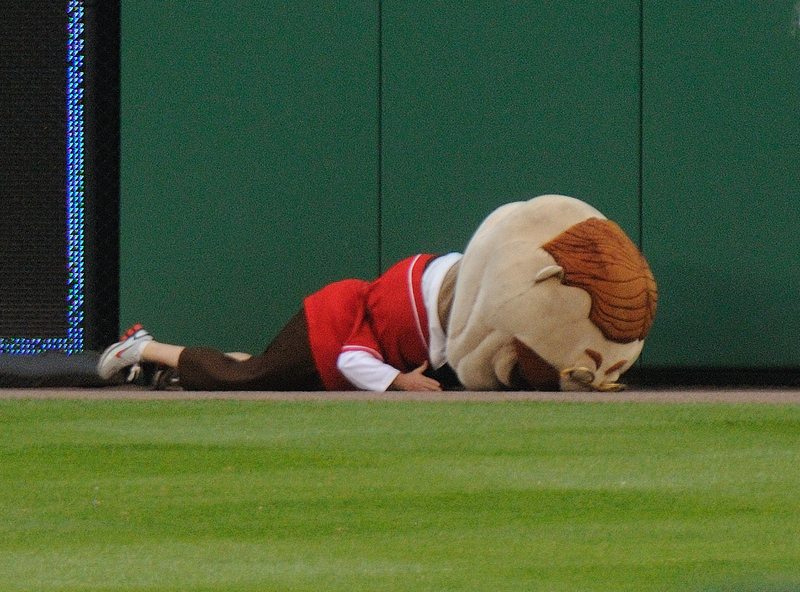 The Nats were eliminated in embarrassing fashion. @hgil @timkrepp positive point to tonight's game – no presidents' race for you-know-who to win and ruin everything! 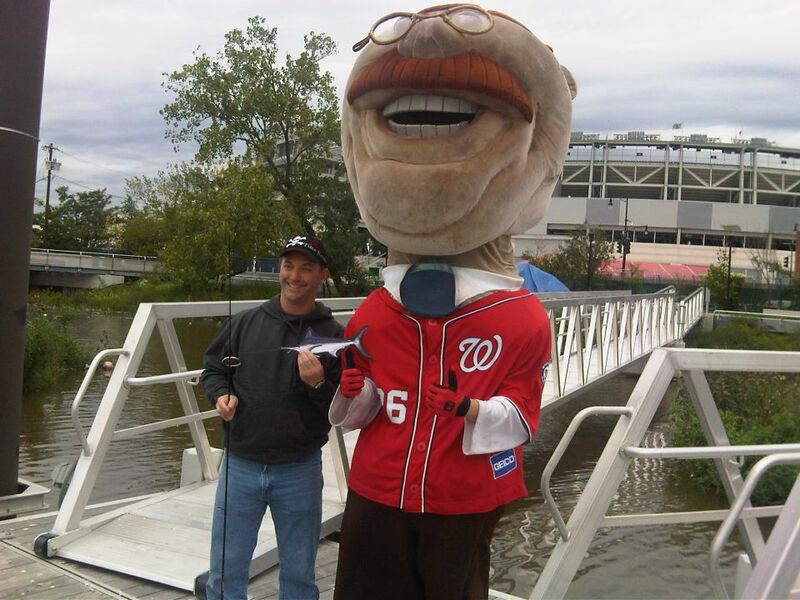 Hey @Teddy26Nats Stop winning the presidents race at the playoffs! It's bad luck! TEAM ABE. I still blame Teddy. May he never win again. Worth noting Nats have now had two division series meltdowns since they let Teddy win. @youonlylizonce never should have let teddy win. I've been saying it for years. So do Nats fans believe in the Curse of Teddy yet? It seems likely that until the Nationals win the World Series, this myth will continue to propogate, but I’d like to offer an alternative interpretation of things. 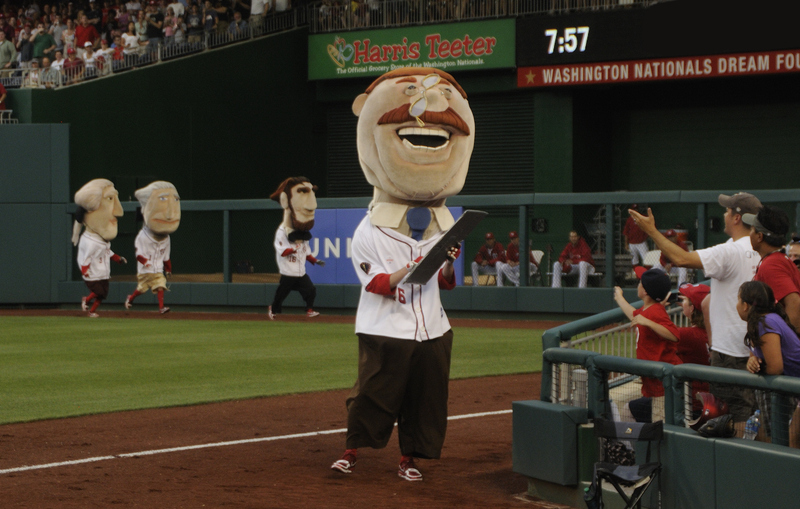 The Nationals introduced a fifth racing president, William Howard Taft, after the 2012 season. Perhaps it’s a #TaftCurse that kept the Nats out of the playoffs last year, and caused this year’s postseason meltdown. Taft knocked things out of balance. He’s not one of the Mount Rushmore four. Get rid of Taft, and perhaps harmony will be restored at Nationals Park. 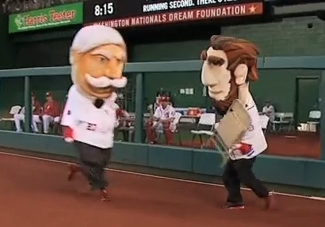 The cheating is getting out of hand in the Nationals presidents race, and if that sounds like nothing new, the difference vs. previous years is that now even Teddy isn’t getting disqualified. On Tuesday and Wednesday nights at Nationals Park, Teddy Roosevelt and William Howard Taft escalated their 100 year-old war, taking each other out as race judge Screech looked the other way. Taft’s antics were simply revenge for the previous night, when Teddy had enlisted the help of longtime nemesis Abraham Lincoln to take Taft out of the competition. On Tuesday, “Honest” Abe sat out the race — literally. 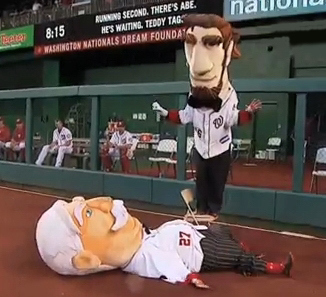 When the race began, Lincoln parked himself on a folding chair on the warning track by the Nationals bullpen. Teddy Roosevelt tore out of the starting gate and slapped hands with the Great Emancipator as he race by the bullpen. Lincoln then stood up, folded up the chair, and swung it right into the oncoming Taft. With the Chief Justice flattened to the ground, Abe unfolded the chair, stood on it, and taunted his victim. No disqualifications were issued. 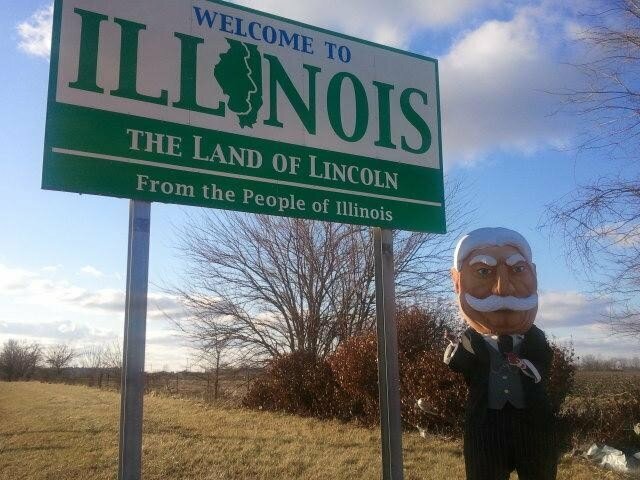 Racing president William Howard Taft gained ground on Teddy Roosevelt late Friday evening as they both crossed the Illinois line after just one day of their race to Mt. Rushmore. The Big Chief followed Teddy in tweeting from the border just before sunset, nearly 700 miles from the day’s starting point. 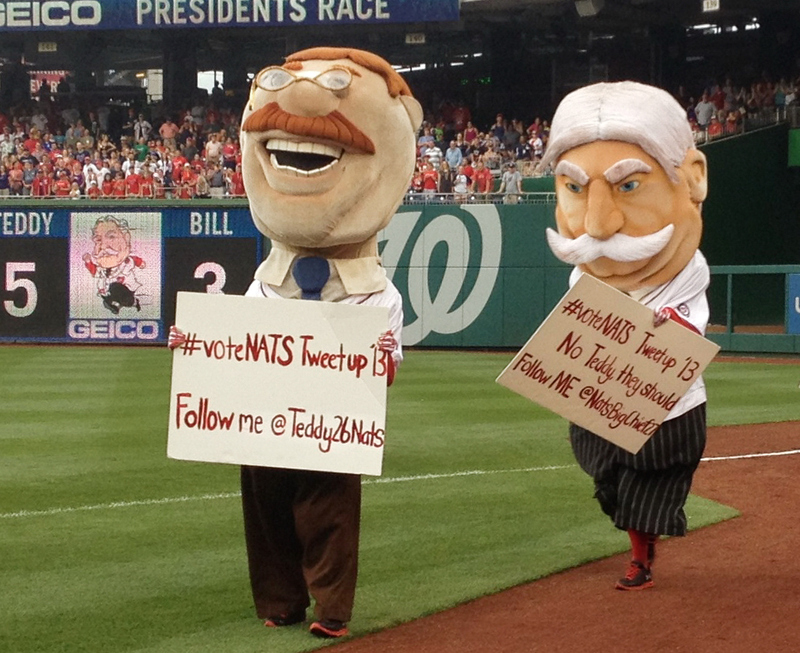 In a Nationals-sponsored Twitter contest, fans have been asked to use the hashtags #VoteBill or #VoteTeddy to show support for either Taft or Roosevelt. Teddy shot out to an early lead, but voting has been light, meaning a Taft comeback isn’t out of the question. Racing president Teddy Roosevelt appears to be making excellent time in his race to Mt. 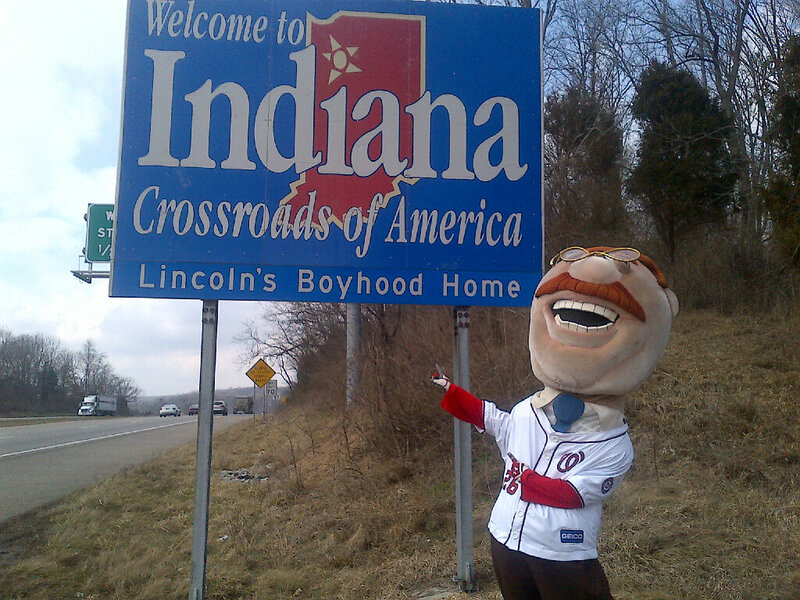 Rushmore, tweeting that he beat rival William Howard Taft to the Indiana border just after 5:00pm Friday. That’s nearly one third of the driving distance from Nationals Park to the South Dakota landmark on just the first afternoon. 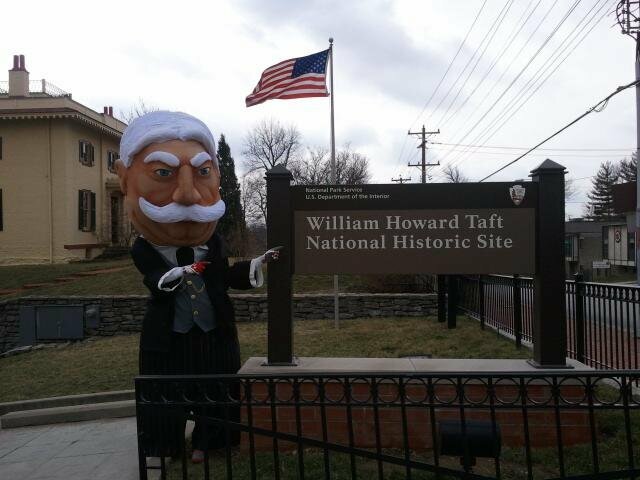 Taft, meanwhile, stopped in Cincinnati to visit his boyhood home. 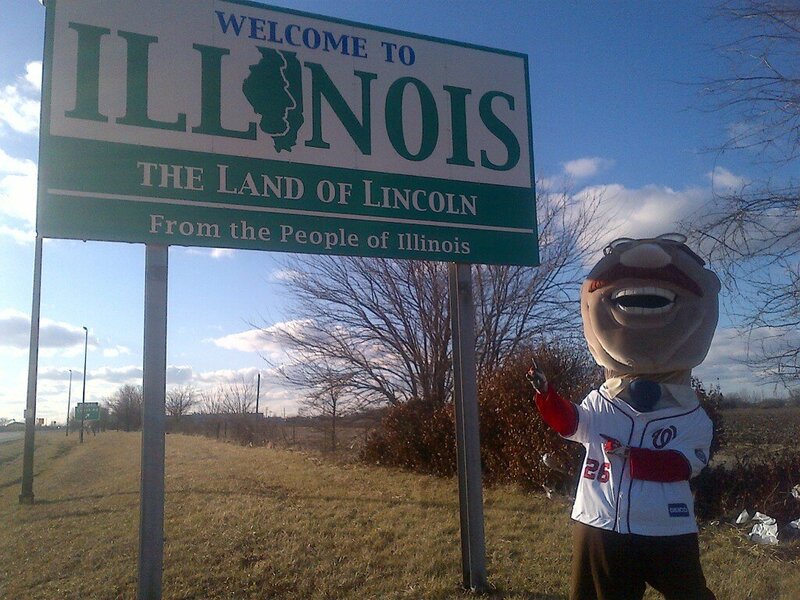 Teddy continues to get triple the fan votes as his rival Taft in the corresponding Twitter contest, but at just 100 fan tweets as of Friday evening, one has to wonder whether the Nationals mascot team had higher expectations from their newly fabricated rivalry. MLB on FOX reporter, baseball writer, and MLB Network insider Ken Rosenthal has used a photo of himself with the Phillie Phanatic as his Twitter avatar for more than a year, and it just rubbed some Nats fans the wrong way. JackoBeam called on fellow Nats fan Allan Petersen (Twitter @ambp77) to come up with an alternative. 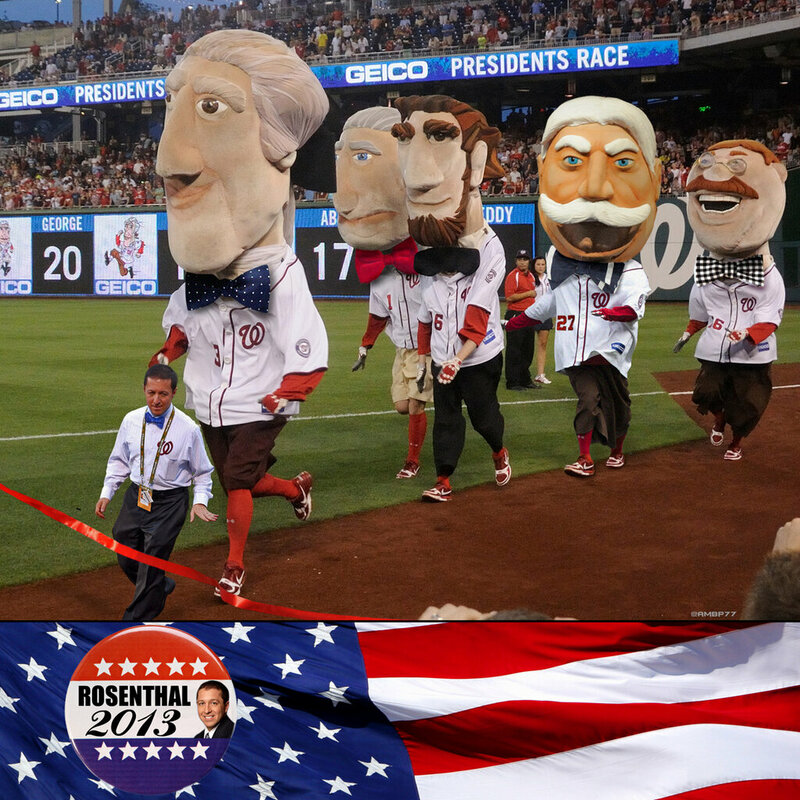 Petersen, who maintains a Tumbler feed devoted to Photoshopped images of the Washington Nationals, went to work, inserting both Rosenthal and new racing president William Howard Taft into a finish line photo, embellished with Rosenthal’s trademark bow ties. All in good fun, right? ‏@beef5669 @Ken_Rosenthal Wait the #Nationals have fans????? @Rodeojones000 @Ken_Rosenthal Additional proof that Nats fans are whining babies. It’s like giving in to 5-yr-old who cries for candy at the supermarket. @Rodeojones000 @Ken_Rosenthal A better avatar would have been you injecting PEDs into their cheating, 21-game-winning pitcher. @Woody2219 @Ken_Rosenthal Wash can’t sell out that stadium w/out the Phillies coming to town. Let’s not forget their over paid/rated rf. werthless! ‏@formtackling @Ken_Rosenthal nationals have fans? ‏@Woody2219 @Ken_Rosenthal u can change ur avatar, but everybody knows who the best mascot is. DC will always b 2nd best to philly! @beef5669 @Ken_Rosenthal Ken did you see last years playoffs? All the #National fans still had tags on their hats and jerseys so the can be returned. @seedanwrite @Ken_Rosenthal Nats fans just started watching baseball like five months ago- why care about them? @LiamJ55 @Ken_Rosenthal all five #Nationals fans? ‏@ScotLarrimore @Ken_Rosenthal “Nationals Fans?” There’s more than one? @11thFloorZack @Ken_Rosenthal couldn’t you have at least let a real fanbase choose the picture? Like fans that actually attend their playoff games? @3Sculli @Ken_Rosenthal the “Phillie Phanatic” u mean and I guess the 18,000 Nats fans are proud now! The Nationals celebrated the first “Ignite Your Natitude Tweetup” at Nationals Park Tuesday night, as the team kicked off its final homestand before the All Star break. Among the near-sellout crowd were over 700 Twitter users who RSVP’d to the event, filling section 140 and collectively doing their part to bring local cellular networks to their knees. Participants who registered in advance via Twitter were treated to a variety of surprise gifts and experiences, from posters to t-shirts to opportunities to leave their seats and rub elbows with Stephen Strasburg and yes, Teddy Roosevelt. The 26th president participated by tweeting before and after the 4th-inning race, and by posing with tweetup participants afterwards. Unfortunately, Teddy tried to tweet during the race as well. When the gates opened, TR emerged carrying an oversized Curly W cell phone. He surged ahead to a huge lead, which he held into the home stretch. But then he tried tweeting. And with that, the Hero of San Juan Hill tripped and executed a face plant along the first base line. Abe stole the win. 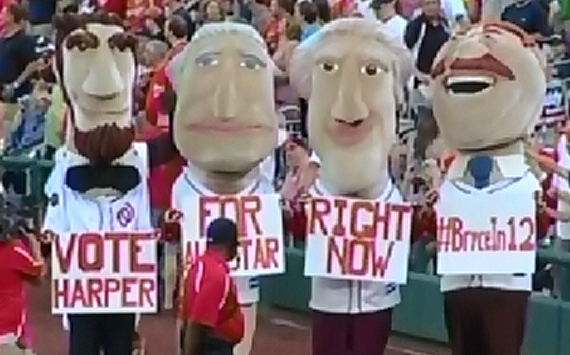 The team continues to use the racing presidents to promote All Star voting, and Tuesday night enlisted the Rushmore Four to hold signs up after the race imploring fans to use hashtag #BryceIn12 and cast their vote for Bryce Harper in the MLB “Final Vote” contest. The effort to get out the vote has certainly had an impact on young Nats fans Jackson Fleischauer and Corbin Haviland, who won the opportunity to hold Tuesday night’s presidents race finish line. All they had to do was fill in 10,000 paper All Star ballots. Yes, ten thousand. Congrats Jackson and Corbin. Well deserved! 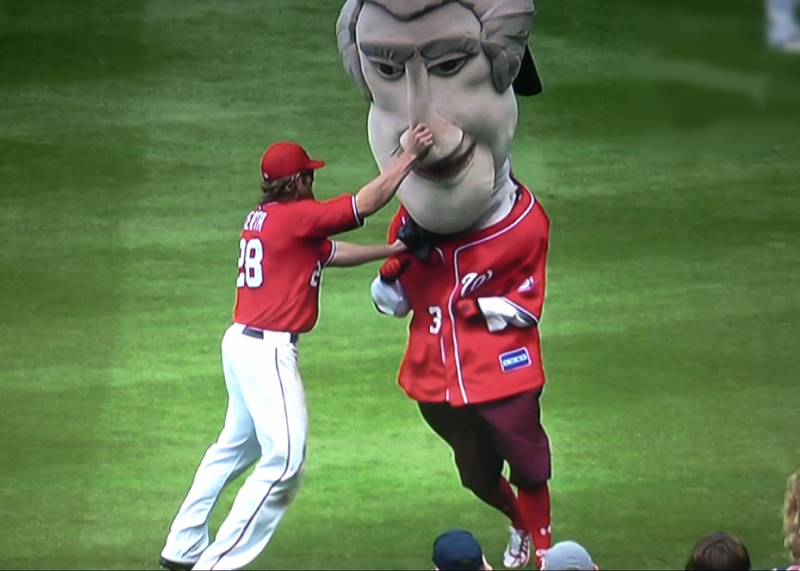 Apparently, Captain Andy Hillstrand of Discovery TV’s Deadliest Catch got to know Teddy Roosevelt on Saturday when he visited Nationals Park to throw out the first pitch. 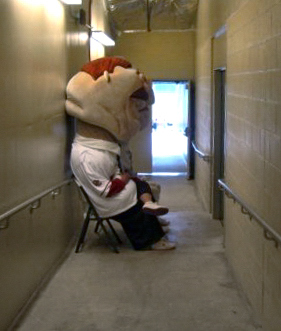 When the Nationals returned to take on the Florida Marlins Sunday afternoon, Roosevelt was nowhere to be found. As the presidents entered the field for their 4th inning race, Teddy appeared on the HD scoreboard. He was still out fishing for Marlin with Captain Andy. The presence of Marlin in the Anacostia River wasn’t the only eyebrow-raising development in Sunday’s race. Thomas Jefferson took his third straight presidents race to suddenly make things interesting in the season standings. 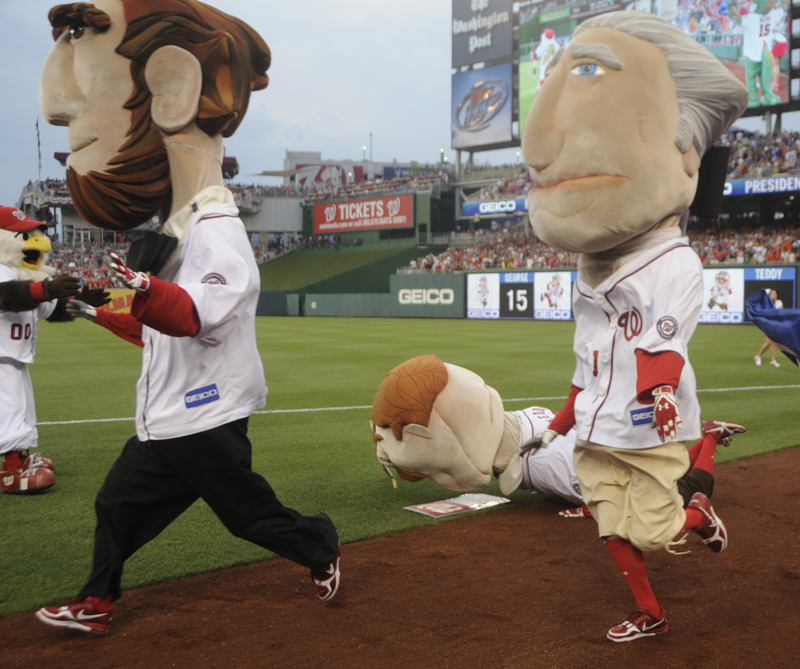 With Abe Lincoln’s lead narrowed to just two games over Tom, the Nats will return to DC next weekend for their final three-game series. Video courtesy of YouTube member lfahome.